Mike Skinner drove his No. 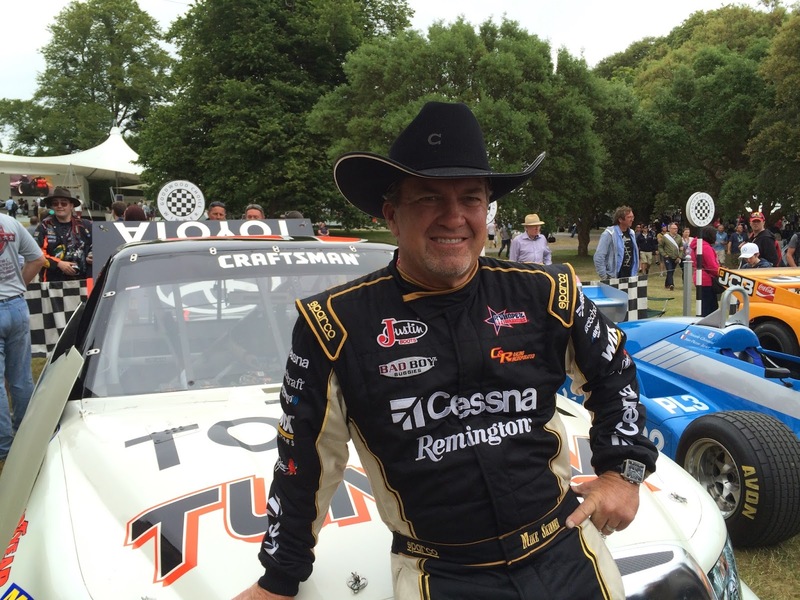 5 Cessna Toyota Tundra to Victory Lane in the NASCAR class at the 2016 Goodwood Festival of Speed in West Sussex, United Kingdom Sunday. The 1995 NASCAR Camping World Truck Series champion also finished third overall, with a 50.44-second effort up the 1.16-mile course. "I'm always honored to compete at the Goodwood Festival of Speed and race up Lord March's famous hill climb course," said Skinner. "We have such wonderful support from our partners like Cessna, Toyota, Caymus Vineyards, as well as our financial partners--SunTrust, Sentinel Real Estate, FocusPoint, Warrington and Florence Capital. With the support of my good friend and team owner Andrew Franzone, who also drives the second of the three NASCAR trucks that we bring, and our team from Racecar Solutions, we're able to build a strong truck every year. “To be able to say that we've won our class each of the last three years is great; but to say that we finished third overall is even more impressive, since the event is typically dominated by four-wheel drive, Pikes Peak-style hill climb machines. I'm really proud of our effort this year. It was awesome to watch Andrew drive on the course. We missed having Bill Goldberg drive our third celebrity truck to raise awareness for Hope For The Warriors, but it opened up a great opportunity for us to put Richard Childress Racing development driver Carter Stokes, as well as US Marine Corps veteran 1stSgt Travis Hanson in our third Toyota Tundra." The 2016 event was marred with weather, as rain showers threatened the forecast throughout the entire three days. After running fifth and eighth in Friday's two batch runs among the field of 53 cars, all three trucks sat out during their batch run on Saturday morning, due to a wet course. On Saturday afternoon, Skinner returned to the track for a qualifying run, which placed him 13th in the heavy rain. By Sunday's finals, Skinner shaved nearly three seconds off his time, clocking the 50.44-second run, despite constantly changing track conditions. "It was awesome to see Mike drive so well in those slippery track conditions and heavy rain," said Franzone. "They say these trucks are built for a good time, not a long time, and this weekend surely put that to the test. Having driven the same course throughout the entire weekend myself in our second truck, I know how awesome Mike's times were throughout all three days, especially during the final shootout run on Sunday. I want to thank all of our supporters for rallying around the Drive For Hope program, which we're so happy to be a part of, while raising funds and awareness for Hope For The Warriors." Hosted by Lord March at the Goodwood Estate in West Sussex, United Kingdom, the Goodwood Festival of Speed features every kind of car imaginable from the 1800s through today while also attracting some of the most accomplished drivers in motorsports. In 2017, the festival will celebrate their 25th anniversary. 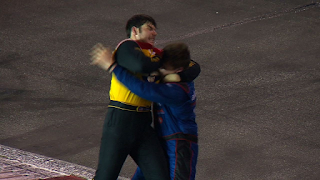 Drivers John Wes Townley and Spencer Gallagher were sanctioned by NASCAR today for their roles in an incident in Saturday night's Camping World Truck Series race at Gateway Motorsports Park. Townley and Gallagher were fined $15,000 and $12,500, respectively, after they tangled twice on the race track and once outside of their racers. Both were also placed on probation until Dec. 31. After a review of the on-track altercation and ensuing physical quarrel in the Drivin’ for Linemen 200, competition officials fined. They collided on lap 145 of the 200-lap event Saturday night, with Gallagher's Allegiant Air Chevrolet clipping Townley's Zaxby’s Chevy and sending it spinning in Turn One. Townley turned the tables 10 laps later, with both trucks making heavy contact with the outside wall. After an exchange of verbal pleasantries, a brief wrestling match ensued, with Townley landing a number of punches before they were separated by NASCAR officials. Joe Gibbs Racing announced today that driver Matt Tifft will undergo surgery for removal of a low-grade glioma in his brain. The slow-growing tumor was found during treatment and evaluation for a recent disc condition in his back. 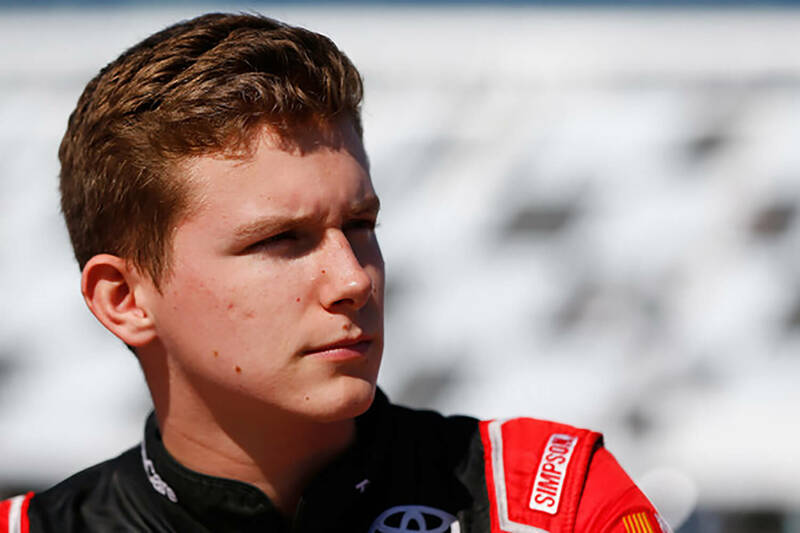 Tifft is expected to undergo surgery and rehabilitation soon and once cleared by physicians, is expected to return to racing. The JGR rookie is anxious to return to the race track as soon as possible. In his absence, David Ragan will drive JGR’s No. 18 Surface Sunscreen/Rugged Maniac Toyota Camry XFINITY series entry on Friday night at Daytona International Speedway. Friday afternoon, Tony Stewart told the world that he is unhappy with his life as a NASCAR Sprint Cup Series driver. Forty eight hours later, he looked like the happiest man on earth. 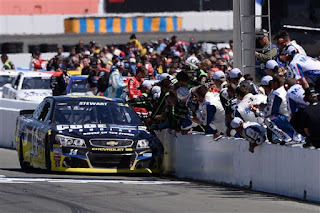 Stewart -- a three-time series champion who has announced plans to retire at the conclusion of the 2016 campaign – held court with the media Friday at Sonoma (Cal.) Raceway, criticizing his fellow drivers and complaining that “driving a Sprint Cup car does not make me happy right now. Stewart also doubled-down on his earlier promise to return to open-wheeled Sprint Car racing next season, for the first time since the on-track death of Kevin Ward, Jr. in August of 2014. “I'm ready to do stuff that makes me happy, and driving a Sprint Cup car does not make me happy right now,” he said.” A lot of things have changed. The atmosphere has changed. There is so much stuff in the garage area that has changed that it was time for me to make a change with it. I've dedicated 18 years of my life to this series and it's done great by me. I've made a great living doing it, but at the same time, there are things I want to do other than be at a NASCAR track three days a week for 38 weekends a year. “I never dreamed there was going to be a time that I would think about something like this,” he admitted. “It wasn't overnight. 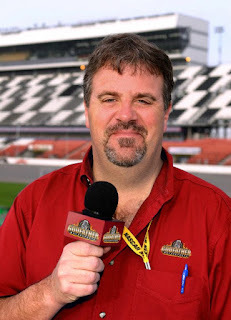 There were weeks that I would think, `Man I really want to go to Monaco and see the Monaco Grand Prix,’ or ` I really want to go to Knoxville for the A-main of the Knoxville Nationals or the Kings Royal at Eldora.' There are things I want to do that, because of our schedule, I don't have time to do. “It's time for me to do them." Friday’s media session was vintage Stewart; outspoken, opinionated and unrepentantly cantankerous. In hindsight, it may also have been therapeutic. For as soon as the green flag flew Sunday afternoon, Stewart’s No. 14 Chevrolet – a car he ranked no better than a Top-15 prospect prior to the start -- was a contender, running lap times equal to the leaders while gradually making its way forward from a 10th-place starting spot. A savvy final pit stop, taken three laps sooner than the other frontrunners, combined with a fortuitous debris caution in the late going to push Stewart into the lead. Once there, the Indiana native did the rest, prevailing in a thrilling, last-lap battle with Denny Hamlin to win the Toyota/Save Mart 350. 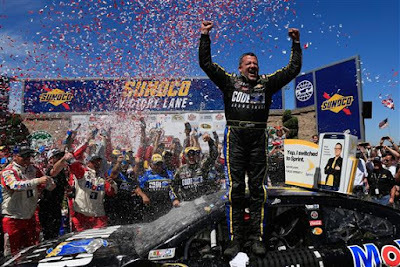 The win – Stewart’s first since first since June 2013 at Dover International Speedway -- erased the biggest roadblock standing between him and a berth in the 2016 Chase for the NASCAR Sprint Cup, virtually ensuring that he will race for the championship in his final season as a NASCAR driver. Wrapped in the emotion of a tumultuous Sonoma Victory Lane, Stewart was understandably in a happier frame of mind. Though clearly exhausted -- both physically and emotionally – the three-time Sprint Cup Series champion said the importance of Sunday’s triumph was already beginning to hit home. 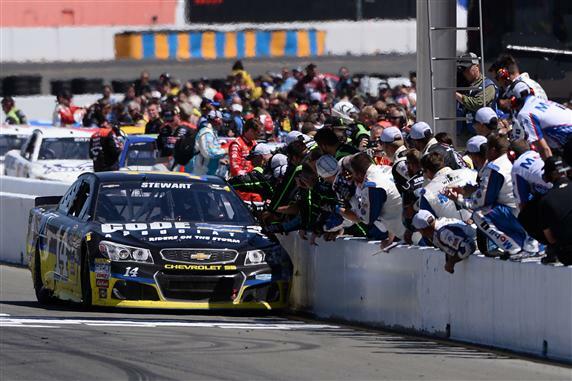 “They’re all good,” said Stewart, slumping onto the front fender of his battered Code 3 Associates Chevrolet. “It doesn’t matter where you get them. Especially at a place you’re (racing) for the last time, it means a bunch. It’s special, trust me." Asked about his final-turn pass of Hamlin, Stewart joked, “If it had been a street fight, he would have two black eyes." Hamlin agreed, saying, "Once I knew he had position and we had a wall on the other side of us, I knew there was a pretty good chance that we were going to go into that wall. I didn't know if he would physically spin me out, (but) I thought there was a very good chance of it, because that's his opportunity to get in the Chase. This was by far the best he's run all year, and he's in his final season. So his give-a-s#it factor was probably really low. “Tony has been ultra-fair to me,” admitted Hamlin. "He has treated me really well my entire career. It's not like I gave him (the win) by any means. He gave me an opportunity to move him, and I did. Then I got it back. It's just part of the deal." Stewart was in rare form for his post-race media availability, as well, laughing that Camping World Truck Series driver John Wes Townley "made my Top-5 hero list of all time" by lobbing on-track punches at adversary Spencer Gallagher the night before. In the end, however, he made it clear that Sunday’s win was not a mission-accomplished moment for him, or his Stewart Haas Racing teammates. "I'm okay if this is the last one I get, “he said. “But I'm not content. I want more. You guys know me well enough to know I'm not laying down." In the end, though, the day was best summarized by Stewart’s 78-year old father, Nelson, whose relationship with his son has been as tempestuous as any other in Smoke’s world. “I knew they were going to have to take it away from him,” said the elder Stewart, as a steady stream of well-wishers offered congratulations and a mammoth crowd roared its approval. “He wasn’t going to let them have it. You get him that close to the checkered flag, and he’s not going to let it go. Go Fas Racing unveiled the throwback paint scheme that the No. 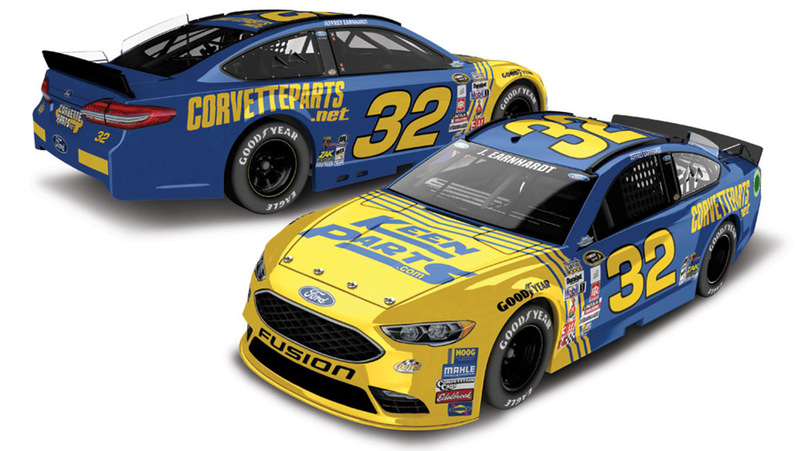 32 CorvetteParts.Net Ford Fusion will carry this September in the Bojangles Southern 500 at Darlington Raceway. The No.32 Ford will pay tribute to Jeffrey Earnhardt's grandfather, Dale Earnhardt, Sr., with a design that combines the No. 3 and No. 2 driven by Earnhardt on his way to 17 Top-10 and nine Top-5 finishes in 1981, including a sixth-place finish in the Southern 500. "I'm pretty excited to have the famous yellow and blue paint scheme in honor of my grandfather for this year's Southern 500," said Jeffrey Earnhardt. "My grandfather ran this paint scheme in 1981, when he started the season as the No.2 car driving for Rod Osterlund. When Richard Childress purchased the team halfway through the season, it became the famous No.3 car, so you have that 32 connection. It's pretty cool to have the chance to bring it back this year. I know we'll have a lot of fun with it, and hope the fans enjoy it as well." In a NSCS career that spanned 27 years, Earnhardt Sr. collected seven championships and 76 victories, along with 281 Top-5 finishes and 25,684 laps led. He also won four IROC championships and scored 21 victories in the NASCAR XFINITY Series. Former NFL, WWE and WCW star Bill Goldberg has been forced to withdraw from this year’s Goodwood Festival of Speed after sustaining knee and leg injuries during a weekend standoff with a chainsaw. "Through many years of competition I have faced very formidable opponents, but this one quickly and concisely slashed its way to the top of the list," said Goldberg. "It might be Chainsaw 1 -- Goldberg 0, but mark my words--I'll be back!" The former WCW and WWE World Champion was set to participate in the 2016 Goodwood event as part of a three-truck team fielded by 1995 NASCAR Camping World Truck Series champion Mike Skinner and partner Andrew Franzone, who bring Toyota Tundras to compete on thee 1.16-mile hill climb course. This year, Skinner will join Franzone and a driver to be named, behind the wheel of the team's three vehicles. 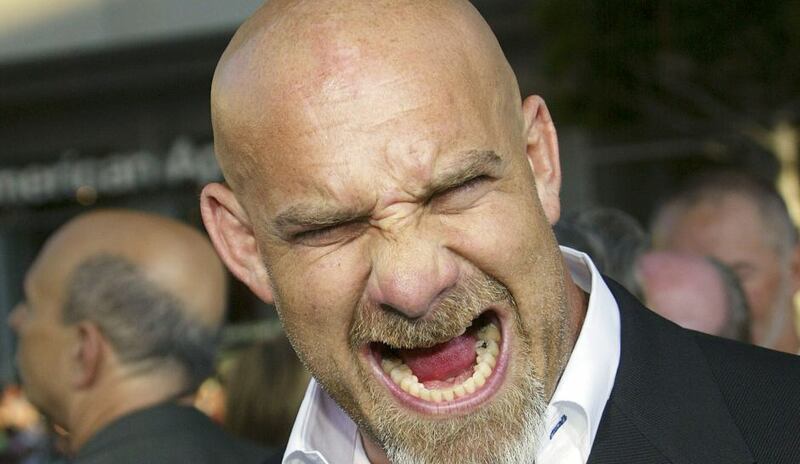 "We were looking forward to having Bill Goldberg as our celebrity driver this year,” said Skinner. “But it was more than just inviting a celebrity guest for us. It was about inviting our friend, and his health definitely comes first. "We're disappointed that he won't be able to join us, but if we're back here next year, he'll be invited to come along again. However, I think he may have a few more stipulations in his driver agreement, (including) no using chainsaws in the weeks leading up to the event. We wish him a speedy recovery and we're looking forward to racing with him in 2017." Hosted by Lord March at the Goodwood Estate in West Sussex, England, the Goodwood Festival of Speed features every type of car imaginable from the 1800s through the modern era, while also attracting some of the most accomplished drivers in motorsports. This year's Goodwood Festival of Speed takes place on June 23-26. Follow @MStheGunslinger on Twitter, or @SkinnerRoundUp on Twitter, Facebook or Instagram for news and updates throughout the event. 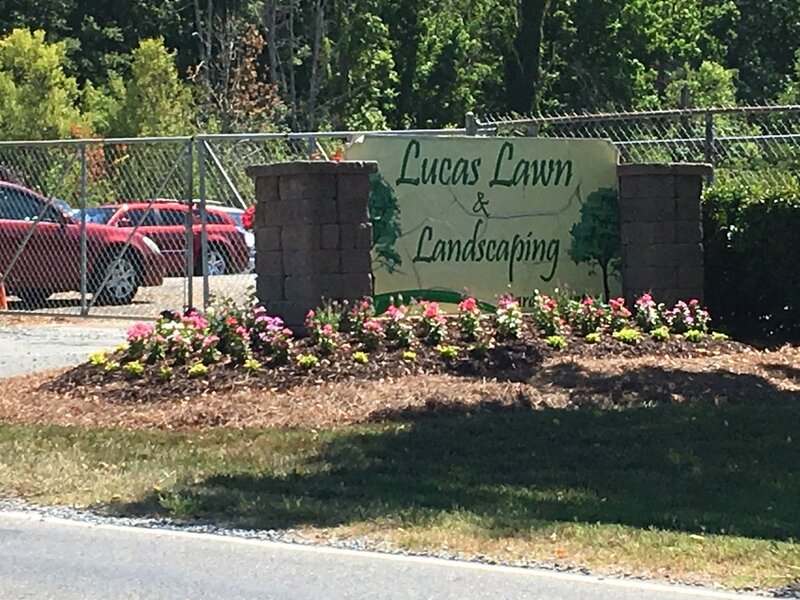 Lucas Lawn and Landscaping is out of a job today, in the aftermath of Friday night’s alleged assault of NASCAR driver Mike Wallace by company employees. Reporter Joe Bruno of WSOC-TV in Charlotte. NC, tweeted this afternoon that PNC Music Pavilion has terminated the Indian Trail, NC, company after three employees were arrested and charged with misdemeanor assault for allegedly assaulting Wallace and his family following a concert by the country group Rascal Flats. Earlier today, the owners of Lucas Lawn and Landscaping issued a written statement complaining of “verbal attacks upon our business” by the media and general public, claiming that only one of the three men arrested is an employee. “This situation arose at an event that did not involve our business or the operation of the business in any way,” they said. 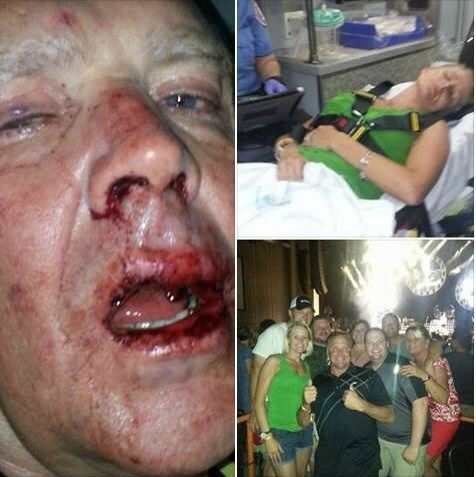 The owners of Lucas Lawn and Landscaping in Indian Trail, NC, released a written statement today, complaining of unfair treatment in the aftermath of an alleged physical confrontation involving the reported owner of the business, Paul Lucas and two of his employees and former NASCAR driver Mike Wallace and his daughter, Lindsey Wallace Van Wingerden, last Friday evening at PNC Amplitheatre in Charlotte, NC. The attack left Mike Wallace with numerous cuts, bruises and broken teeth, after he was allegedly punched and kicked by Lucas, 29, Nathan Lucas (22) and Randolph Mangum (24). Lindsey Van Wingerden suffered bruised ribs after also allegedly being kicked while attempting to shield her unconscious father from further attack. “On Friday, June 17th one employee of our company was accused of being involved in an assault upon one Mike Wallace and Lindsey Wallace Van Wingerden,” said the written release. “Since that time Mr. Wallace and various other individuals have chosen to post statements, comments and opinions regarding the circumstances on social media websites. This has resulted in verbal attacks upon our business, suggestions that our clients abandon our company and innuendo regarding our business that we believe is designed to both frustrate the proper administration of justice within our court system and prevent our company from continuing to do business where we employee (sic) over 70 individuals who work hard and depend upon their jobs to support themselves and their families. This situation arose at an event that did not involve our business or the operation of the business in any way. The efforts being made to disparage our business and negatively impact its hardworking employees is both disturbing and uncalled for. This is, in our opinion, a mechanism being used to point blame at those who had no involvement in the matter and, simultaneously, deflect any inquiry into the actions and behavior that may have occurred at the time the situation arose by those making the accusations. Our company takes the actions of its employees, both on and off the clock, seriously and we plan to diligently and appropriately evaluate all of the accurate and undisputed information. However, we respectfully ask that those who rely on social media postings and one sided representations of fact CONSIDER the motivations behind those efforts. No one at our business would expect those who patronize the business of another to vilify or otherwise judge that business based upon what are solely accusations and finger pointing at any one or more of their employees. We feel certain that if a similar situation were occurring to Mr. Wallace, he would be asking for a fair and reasoned approach that included both sides of the equation, not just the one desired by the complaining party. We ask that a rational and objective assessment of the matter be considered before taking actions, as suggested by others, that would harm our professional activities and the families who gain support from our business operations. We are saddened that we have felt the need to engage in this release but it does, unfortunately, appear that Mr. Wallace and his supporters intend to have this matter resolved in the court of public opinion. This is NEITHER FAIR NOR appropriate for any of the parties involved to include mr. Wallace himself. This is especially true related to our business which had absolutely no involvement in the matter. We hope that the public will do as we intend, by gathering facts that are properly vetted. NASCAR driver Mike Wallace was hospitalized Friday evening after being assaulted by three men following a concert in Charlotte, North Carolina. Wallace, his wife Carla, daughter Lindsey and son-in-law Thomas Van Wingerden were leaving a performance by the country group Rascal Flats at PNC Amplitheatre when they were confronted by three assailants. The 57-year old Wallace was rendered unconscious in the attack, then kicked repeatedly in the face and head as he lay unresponsive on the ground. Lindsay Wallace Van Wingerden attempted to shield her father from the attack and was kicked repeatedly, as well. Their alleged attackers were apprehended by the Charlotte Mecklenberg Police Department after witnesses provided a description of their vehicle; a white Chevrolet Silverado pickup truck with signage advertising a local business, Lucas Landscaping of Indian Trail, NC. Paul Lucas, 29, president of Lucas Landscaping, was arrested and charged with a single misdemeanor count of Assault on a Female and released on $1,500 secured bond. Nathan Lucas, 22 and Randolph Mangum, 24, were each charged with single counts of misdemeanor assault and released on a $1,000 bond. 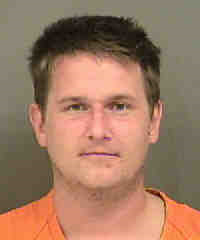 All three are due in Mecklenburg County District Court on July 22 to answer the charges. A check of public records reveals that Mangum served 30 days of a one-year sentence in February of 2011 after being convicted of DUI, Driving With a Revoked License and Driving Under the Age of 21 While Consuming a Contraband Substance. Wallace is a four-time winner in the NASCAR Xfinity Series, with 22 Top-5 and 66 Top-10 finishes in 494 career starts. He also has 197 starts in NASCAR’s premier Sprint Cup Series, with three Top-5 and 14 Top-10 finishes. He has not competed this season, after undergoing triple bypass surgery in April of 2015. GodfatherMotorsports.com has learned that Matt Tifft’s scheduled double-duty weekend at Iowa Speedway has been derailed by injury. Tifft was scheduled to drive the No. 11 Toyota Tundra for Red Horse Racing in Saturday night’s Speediatrics 200 NASCAR Camping World Truck Series event at Iowa, and the No. 18 Toyota-backed Camry for Joe Gibbs Racing in Sunday’s Xfinity Series American Ethanol E15 250. Multiple sources say Tifft is battling a disc problem in his back, and will not compete in either of this weekend's events. He will be replaced in Sunday’s Xfinity race by veteran Sam Hornish, Jr., making in his first NASCAR start of the 2016 campaign. No replacement has been confirmed for Saturday night's Truck race. 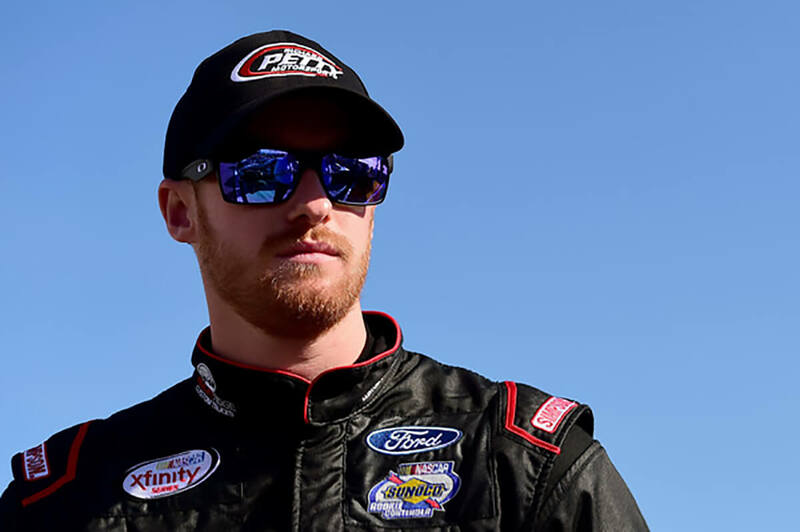 Tifft, a native of Hinckley, Ohio, has run six of 13 races this season on the Xfinity Series, with back-to-back eighth-place finishes in his last two starts at Talladega and Dover. 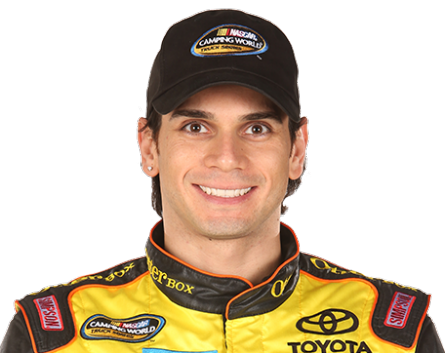 He has also made three Truck Series starts in 2016, with a best showing of fifth at Charlotte Motor Speedway. 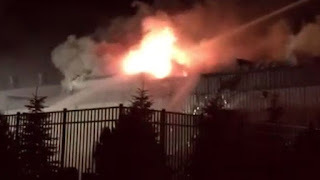 Fire gutted the Sandusky, Ohio headquarters of ThorSport Racing Monday morning. Multiple fire departments responded to the blaze at ThorSport’s 100,000-square foot race shop, with flames seen above the roofline. The team issued a written statement this morning, saying, "Shortly after midnight on Monday morning, a fire broke out in the basement of the ThorSport Racing shop, located in Sandusky, Ohio. At this time, we can confirm that no one was injured. We are currently working with the fire department and local officials to contain the blaze, and assess the damage. We do not expect this to impact the team's competition schedule. Our next race is at Iowa Speedway in Newton on Saturday, June 18. Further details will be forthcoming." ThorSport Racing – owned by Duke and Rhonda Thorson -- is the longest tenured team in the NCWTS and fields full-time entries for Matt Crafton, Rico Abreu, Ben Rhodes and Cameron Hayley. 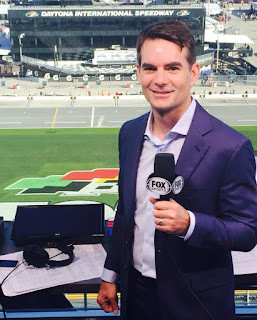 Former Sprint Cup Series champion-turned-television analyst Jeff Gordon got his first taste of media backlash today, in the aftermath of comments he made early in Sunday’s Axalta We Paint Winners 400 at Pocono Raceway. Working alongside colleagues Mike Joy and Darrel Waltrip, Gordon commented on an illegal body modification penalty assessed to Brad Keselowski’s team by NASCAR, after a crewmember shoulder-blocked the right-rear fender of the Miller Lite Ford in an attempt to increase aerodynamic sideforce. He also accused FOX of singling out his team, saying, “every car I saw” had some degree of body modification performed during pit stops. He said he did not know whether the modifications made to his car were more blatant than others. While Gordon’s description of the Miller Lite team's pit stop was 100% accurate, he did make one factual error yesterday. As FS1 rolled video of a pit stop by the No. 2 team earlier this season at Las Vegas Motor Speedway, Gordon stated that the team had also been penalized for an illegal body modification that day, when they had not. Welcome to the media, Jeff! The team committed an identical violation that day, but was fortunate enough not to get caught. Let’s get real, for just a moment. It’s no coincidence that when Keselowski’s ’s jack man “tripped and fell” yesterday, he just happened to lower his shoulder and leave a substantial, man-sized dent in the side of the Miller Lite Ford; right where it was sure to help the most. The No. 2 team is not the first to be apprehended in the midst of such a nefarious exercise this season, and they won’t be the last. They do it because it works, as evidenced by the fact that nobody ever trips and caves in the NOSE of a race car, negatively impacting the aerodynamics and ruining their team’s day. It’s no coincidence that these pit-road mistakes – every single one of them – somehow result in the race car going faster, rather than slower. 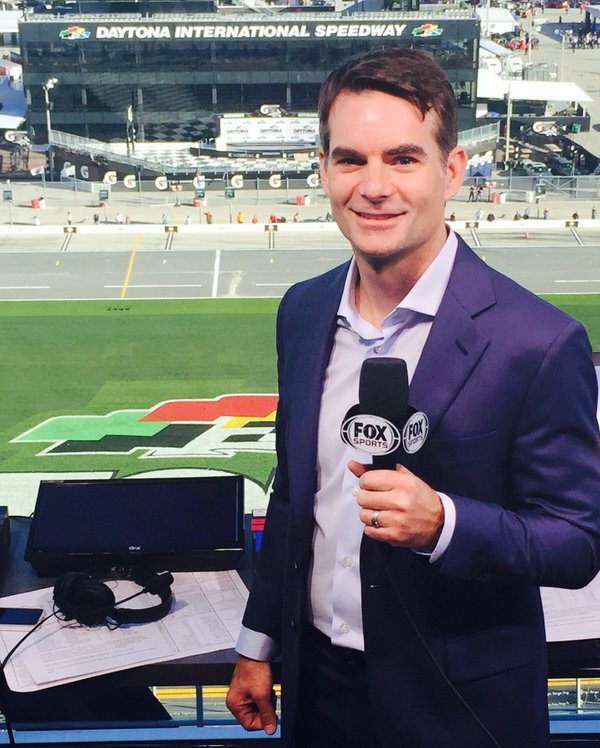 The critical question here is not whether Jeff Gordon is biased. Whether its breast vs bottle as an infant, or strained peas or carrots as toddlers; we all begin accumulating preferences and biases, virtually from our exit from the womb. Anyone claiming to be unbiased is either an idiot, a liar, or both. And Jeff Gordon is none of the above. His assessment of the No. 2 team’s early race pit stop yesterday was eloquent, factual and 100% accurate. It had nothing to do with his minority ownership of the No. 48 Hendrick Motorsports Chevrolet team, and everything to do with the obvious violation of an important NASCAR rule. If Gordon has been unfair to anyone in his on-air efforts this season, we haven’t heard about it. He has offered straightforward assessment of his former team and its competitive struggles, and no more effusive in praising his successor, Chase Elliott, than the rest of NASCAR Nation. Gordon is paid to share his insight, experience and opinions, and in my opinion, he’s doing a bang-up job of it. There are two possible solutions to this “problem;” if a problem truly exists. Option One would be to replace Jeff Gordon in the FOX broadcast booth with someone less informed, less eloquent and less able to deliver his special brand of insightful, though-provoking analysis. That would be a tremendous mistake; one that our colleagues at Fox Sports are not about to make. Option Two would be for all of us to accept that Gordon has inherent preferences and biases, just like Ned Jarrett, Benny Parsons and the Waltrip Brothers before him. Once we accept that simple reality, it should be relatively simple to move forward, appreciating Gordon for what he is; an enlightened, opinionated and valuable voice at the very center of our sport. Personally, I vote for Option Two. No one seems certain how it happened, or why. But in recent weeks, NASCAR has found itself in the unenviable position of suspending and fining top Sprint Cup Series crew chiefs for violating a “safety rule” that has no discernable impact on safety. Last week, the crew chiefs for drivers Kurt Busch and AJ Allmendinger earned $20,000 fines and one-week suspensions when their cars were found to have a missing or loose lug nut during the running of the Coca-Cola 600 at Charlotte Motor Speedway. Those missing lugs had no impact on the competition, and no one’s safety was not compromised. By all accounts, Busch and Allmendinger were unaware that they competed with less than a full complement of lugs, until informed by NASCAR following the event. And yet, fines were levied and suspensions handed down. Eighteen months ago, NASCAR was happily out of the nut business, after announcing that a longstanding rule requiring five secure lugs per wheel would be stricken from the 2015 rule book. As they often do, teams quickly found a way to exploit that change to their own benefit, expediting late-race pit stops by attaching only four (or in some cases, three) lug nuts. That strategy carries a degree of inherent risk, and this season, a handful of drivers have been forced to return to pit road pit after experiencing on-track vibrations caused by loose lug nuts. 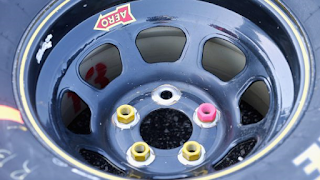 Despite the fact that not one crash has occurred due to loose or detached lug nuts, however, some of the sport’s most respected drivers have railed against the so-called “danger” or doing so, demanding that NASCAR save them from their own teams by once again requiring five secure nuts per wheel. Former Sprint Cup Series champion Tony Stewart was the most vocal of the group, accusing the sanctioning body of turning a blind eye to safety. NASCAR quickly found itself painted into a public relations corner. Labeling uncaring by one of its top drivers and spurred to action by others, the sanctioning body had little choice but to once again begin policing an area of the sport that it has no need, desire or reason to enforce. Unfortunately, Knaus’ common-sense appeal was drowned out by the Chicken Little rantings of others, whose predictions of weekly death and dismemberment dominated the headlines, despite the complete lack of any proof that such a risk truly exists. No matter what you may have read on social media lately, wheels rarely break free from NASCAR stock cars. And when they do, loose lug nuts are almost never to blame. In the final race of the 2004 season at Homestead Miami Speedway, eventual series champion Kurt Busch’s right-front wheel came loose in Turn Four. That incident occurred when the center of the wheel failed, however, and had nothing to do with loose lug nuts. Most NASCAR fans are hard-pressed to recall even a single instance of loose lugs causing a wheel to roll free, despite the fact that in virtually every NASCAR Sprint Cup, Xfinity and Camping World Truck Series race, lug nuts are left loose or missing; either inadvertently or intentionally. Loose lugs every week for decades, with nary a single errant wheel to show for it? Whose definition of "safety issue" is that? It’s a ludicrous premise, especially in a season when so many drivers have blown right-front tires and hit retaining walls at high rates of speed, due to overaggressive right-front camber and air pressure settings. Goodyear and NASCAR issue “recommended” camber and air pressure settings each week, but they are not policed on race day. Instead, teams are allowed to make their own decisions, often pushing the envelope for increased performance, while accepting an increased risk of tire blowouts. Why is nobody wailing about the dangers of excessive camber and reduced air pressure? Why are there no drivers demanding that NASCAR immediately begin overseeing these vital safety concerns? Simple. Because this senseless debate is fueled entirely by emotion, rather than fact. Fact is, not a single car has crashed this season due to a detached wheel. Not one. In marked contrast, two cars have crashed due to detached steering wheels. Six-time series champion Jimmie Johnson suffered a hard qualifying crash during at Phoenix International Raceway in March, while Dale Earnhardt, Jr. was briefly forced to steer with his hands when the steering wheel of the No. 88 Chevrolet detached under caution at Talladega Superspeedway. In the aftermath of those incidents, there were no new rules implemented and no hysterical predictions of doom. Just promises from both drivers to be more observant in the future, to avoid putting themselves in harm’s way. That’s a common-sense approach, in marked contrast to the sky-is-falling idiocy now running rampant in the NASCAR Sprint Cup Series garage. NASCAR does not deserve the negative publicity they have received in recent weeks. Tony Gibson and Randall Burnett did not deserve to sit home while their teams labored short-handed at Pocono Raceway this weekend. And NASCAR fans do not deserve to be misled; fed a line of bull about a non-existent safety concern that is really no concern at all. Germán Quiroga will return to Red Horse Racing at Texas Motor Speedway next Friday night. Quiroga will step behind the wheel of the No. 11 Toyota Tundra for the June 10 NASCAR Camping World Truck Series race at the Fort Worth facility, with the possibility of additional races if sponsorship can be secured. "We're very excited to welcome Germán back to the Red Horse family," said team owner Tom DeLoach. "We have a great opportunity to get him back behind the wheel and if sponsorship can be found, we hope to be able to run several more races with him." Quiroga piloted the No. 77 Toyota Tundra for Red Horse Racing in 2013 and 2014, recording five Top-5 finishes -- including a third-place finish at Texas Motor Speedway in 2013 -- 16 Top-10s and one pole position. "I'm very happy to return to Red Horse Racing," said Quiroga. "I hope we can put together a great run at Texas and that we will be able to put something together so I can keep competing this season." Matt Tifft will also return to Red Horse Racing for several additional races this season, with dates to be announced. Richard Petty Motorsports has suspended operations of its No. 43 XFINITY team due to financial issues with the team's primary sponsor, J. Streicher. Due to missed payments, the team announced today that it will cut back the NASCAR XFINTY Series No. 43 Ford Mustang driven by Jeb Burton from what was originally expected to be a full-time schedule. J. Streicher is in its first year of sponsorship in NASCAR, after signing on just prior to the season-opening event at Daytona International Speedway. The team has recorded one Top-10 and four Top-15 finishes in the first 10 races of 2016 and is currently in position to compete for the Chase in the NASCAR XFINITY Series. Richard Petty Motorsports CEO Brian Moffitt called the move, “an unfortunate situation," adding, "we make commitments to both our employees and vendors that are based on sponsor commitments, and we take those commitments seriously. We will pursue every avenue to ensure the contractual obligations between RPM and our sponsor are met. We'll take each week as it comes and do our best to get the No. 43 Ford Mustang on track as much as possible this season." Richard Petty Motorsports and Burton will continue their relationship, and the team said it hopes to get Burton on track as much as possible this season. This weekend at Pocono Raceway, Burton will compete in the No. 32 Sprint Cup Series Ford for GO FAS Racing.